“I don’t suppose it matters which way we go.” Directed by Nicolas Roeg (The Man Who Fell to Earth) and very loosely based on a 1959 novel by James Vance Marshall (a pseudonym for Donald G. Payne), this visually stunning, existential film is set in Australia and effectively contrasts “civilized” modern civilization with the unforgiving wilderness of the Australian outback. Due to a set of bizarre and disturbing circumstances (which I won’t ruin here for you), a teenage girl (Jenny Agutter) and her younger brother (Luc Roeg, son of the director) get stranded deep in the Australian outback. They are befriended by an Aboriginal boy (David Gulpilil), who is undergoing a “walkabout” – a rite of passage among Aboriginal Australians. He helps guide them back to civilization. 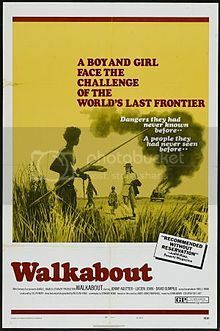 In an 1998 interview, Roeg remarked that Walkabout is “a simple story about life and being alive, not covered with sophistry but addressing the most basic human themes: birth, death, mutability.” English playwright Edward Bond wrote the screenplay. You may remember Agutter as “Nurse Alex Price” in An American Werewolf in London (1981), while John Meillon, who portrayed the father in Walkabout, appeared as “Walter Reilly” in Crocodile Dundee and Crocodile Dundee II.